Revenue from email marketing has increased by 28% from 2013-2014, having an outstanding ROI of 4300% (econsultancy); making email marketing a priority when looking into cost effective digital marketing options. The goal of this post is to get small businesses headed in the right direction, with as little cost to the business as possible. Taking advantage of email marketing is not difficult when using mailing list management software such as http://mailchimp.com/. It is also free to create an account. This software allows you to arrange and refine email lists, track user behavior and create professional appearing emails. The software provides you the freedom to update and prioritize your contacts according to their interests or participation level. It is important to have an active list, meaning, only sending emails to those reading and interested in your content otherwise you run the risk of being labeled as spam, which will be addressed later. E-consultancy’s survey has shown that only 7% of businesses find email marketing to be not effective. A 93% approval rating for those who implement an email marketing strategy should make reading and sharing this post an easy choice. We are going to cover how to set up an emailing list management account, keys to optimizing your email campaigns and the benefits email marketing brings to your small business. Setting up a mailing list management account can be done in just 4 simple steps. 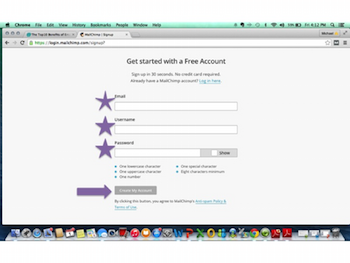 We suggest using Mail Chimp for 2 reasons: it is free to create an account, and it is easy to use. You can open a second browser window and follow the steps below as an easy-to-follow guide. The first step is to go to Mail Chimp’s home page. 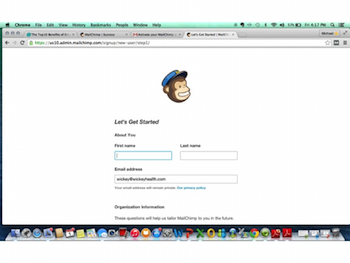 Up at the top right corner of Mail Chimp’s website is their sign up button. Go ahead and click on that button to get the whole process started. 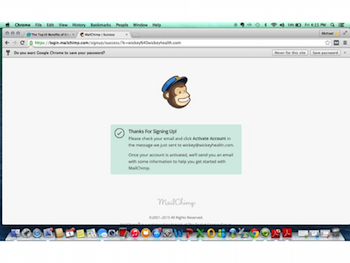 The first thing Mail Chimp will prompt you for is your email. Make sure you list your primary email for the best communication line between you and Mail Chimp. Next, create a username and password. Once you have those two filled in, click on the “create my account” button. Mail Chimp runs what’s called a double opt-in procedure. What this means is they will send you an email asking you to verify that you indeed want to use Mail Chimp’s services. We mention this here because this is a strategy that you should use when developing your mailing lists in the future. You want relevant contacts. It is better to have a list of 100 readers, than 2,500 that will never open your email. After going to your email and confirming with Mail Chimp, they will redirect you to this page here. Make sure to fill in the entire form then click to finish generating your account. After finishing the preliminary admin work, you will be taken to this screen. You can set up an email campaign from here, create a list, start building your audience and even invite your colleagues. Now that you have an account set up and created a list (or imported a list of contacts you already had – you can import from excel), it is time to create a campaign. 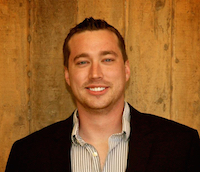 There are several ways that we have found to optimize your emails for a higher ROI. Think about how much your email is bombarded with advertisements. Then think about how many emails you delete without opening them. This is why it is so important to have a subject line that screams “OPEN ME!” You know your customers and what is important to them. Use this knowledge as a point of reference, if you are having trouble coming up with an attention grabbing subject line I suggest visiting Marketing Profs blog. If you were a machine shop owner your clients (or email list) would be interested in you purchasing a new machine that is faster, allowing you to complete work cheaper than before. You need to make sure the subject line gets that information across as concisely as possible. “Saving You Money With New Additions To Our Company,” would be a great subject line. Whether a customer is buying your latest widget, or reading your latest post, your call-to-action needs to be clearly shown in your email. The digital marketing team at KriXis Consulting has found opening and ending with the same call-to-action yields the best results. Additionally, we have also found putting the ending call-to-action on its own line receives more clicks. You need to provide direction to your audience. Words alone will not grab attention. 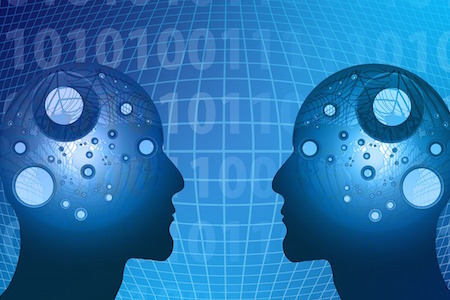 Human beings are visually stimulated; use this to your advantage. You will want to find something that is both attention grabbing and relevant. Pixabay is a great place to find professional images for free if you do not have your own. 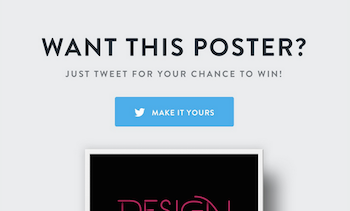 The image below is a great example for advertising this blog post through email marketing. Your email list is not just one giant collection of contacts. Each of those contacts falls into different sub categories that can boost targeting. You have three types of buyers: steel, aluminum and copper. You purchased the new machine mentioned above in the subject line section, and it can be used for all metals; you may want to email all three groups. A week later you discover a new use for copper. In this case it would be best to only email the copper buyers. This promotes social sharing of your email, and allows those reading your email to connect with you on other platforms. Your business will be rewarded on Google’s search engine results as more social media signals are pointing back to your website. The days of only checking email on your computer are gone. Smart phones allow your contacts to check their email anywhere, and you need to tailor your emails to this. 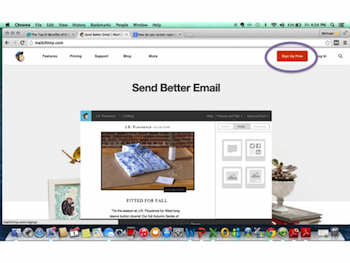 Mail Chimp allows you to send test emails before messaging your entire list. We suggest emailing yourself the test and opening it on your phone. You may be surprised and find out what looked great on your computer, looks awful on mobile. It is also equally important to use a format that makes sense, here is a logically formatted email: title, attention, call-to-action, grabbing phrase, body and call-to-action. This is basic, but works. Simple and easy to follow emails provide the best user-experience. You can get penalized from too many spam complaints. The penalty is having your emails filtered as spam by those who have not even reported your message as spam. The best way to avoid this is to make sure the “unsubscribe” button is big and clearly visible in your emails. Losing one subscriber is way less of an impact than having dozens of people on your list not see your latest promotion because it was marked as spam. For more information on how spam affects your email I suggest reading this post by Search CRM. 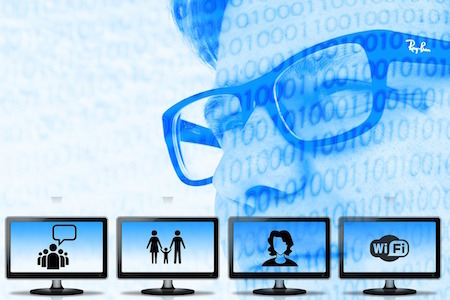 Email marketing requires analyzing the data and making adjustments. It is a constantly evolving process and needs to be evaluated regularly to make sure the practices you are using are indeed being effective. 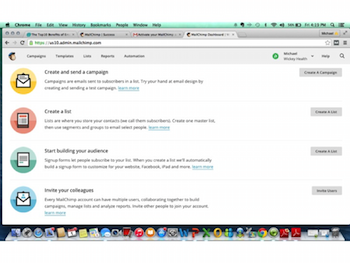 Mail Chimp is a great tool, since it gathers all of this information for you. Professional help is available, KriXis Consulting offers email management services, allowing you to focus on your business, while we track the data and make adjustments. Typing in multiple emails into an address bar is a thing of the past. One click composes a personalized email (based on their name and information you have stored) to a small target group, or your entire emailing list. Mail Chimp also has premade templates, allowing you to focus on the message and not the layout. Mailing List Marketing will give you the opportunity to stay more connected with your customer base. It is important to note that emailing once per week is considered best practice. Many people never think about how an email is going to appear on someone’s phone. Using an email management system will let you view the message from a mobile device before you send it to your list. The great thing about email is the ability to forward messages. The creation of a successful email campaign increases the chances of your message being shared. The monetary cost associated with beginning an Email Marketing Campaign are very low. The management tool is free (unless you have enormous email lists or want more than basic features), and you can take the time to manage everything yourself. However, as with everything time related there is an opportunity cost, which is why mailing list management is one of our digital marketing services growing in popularity for small businesses. Mailing List Marketing Software tracks the following data: how many people opened an email, how many people clicked a link in email, which specific link within an email was clicked, how many people complained that an email was spam or unsubscribed and whether your email made it to the inbox of your subscribers. You get the feedback that matters instantly. Effective marketing campaigns can transform a business. Becoming an early adopter to technology puts you ahead of everything else. You should now be able to open a mailing list management account, understand the basics of how to use it and see the benefits it has for your business. Thank you for taking the time to read this post. We always appreciate sharing our content as well. If you have any further questions, please comment below.